Showing results for tags 'Character Lore'. Hello, hello! Isn't the background I chose lovely? I'm not quite sure how it happened, but that's what makes it so fun! Bight colors go with everything, in my opinion! But interior decorating aside, let me just say that I can't beleive that this place of the Internet existed! I have never seen so much chaos in all of my life! I can hardly contain myself! Whoops, I forgot to introduce myself. If you beings of this Internet do not already know, I am Discord! The spirit of disharmony, chaos, the unexpected, you name it! Allow me to show you what I mean: Oh, but I know what you're thinking now. Discord must be evil! But I hate to admit it, as wonderful and handsome as he seems! Well, I can assure you, I am not evil. In fact, I am one of the friendliest people I know! Sure, it was only a while ago that I was introduced to the strange concept of friendship, (quite a long story) but I beleive that in the short time that I have mastered it! Just look at how many wonderful friends I have! 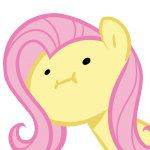 Of course, my bestest friend surely has to be my dear Fluttershy. See the yellow pegasus up there? Isn't she just lovely? ...Uhm, not in that way of course. A draconequus such as myself has no need for romance! Ah, I believe that's all I can say... for now,! You'll just have to see what chaos awaits you! Besides, I have...business to attend to. Toodles!